Bull in a China Shop, by Kent Monkman, above, is on the cover of our new issue. 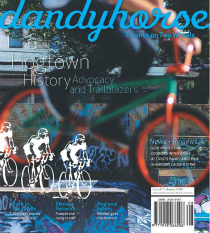 dandyhorse issue 13 // summer 2016 is here! U.S. and International customers, please email subscribe@dandyhorsemagazine.com and we will send you a PayPal invoice if you want to sign up today. 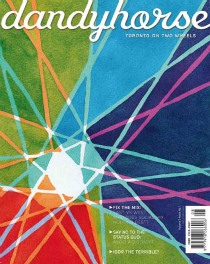 On newsstands July 2015. Subscribers get it first. 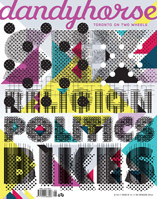 Free at better bike shops: Bikes on Wheels, Urbane, Sweet Pete's and Hoopdriver. Next up: BIG BEST OF DANDYHORSE ISSUE! Please pay via PayPal or email: subscribe@dandyhorsemagazine.com if you have any questions. If you would like to subscribe to dandyhorse magazine please email subscribe@dandyhorsemagazine.com with your request. OUR SAFETY 2013 ISSUE promotion is now over. dandyhorse Issue #10 (a.k.a. 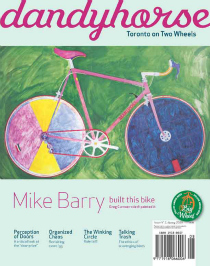 the safety issue) is now in sponsor shops and at better book and boutique shops. 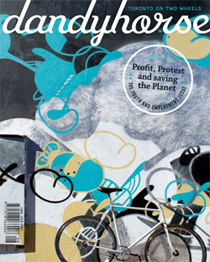 dandyhorse issue #10 is now available for $10 - order here via Paypal. HST and shipping are extra. Cover illustration by Trio Magnus. In the meantime please email subscribe@dandyhorsemagazine.com to place your order today. Cover by Trio Magnus for Issue #10. 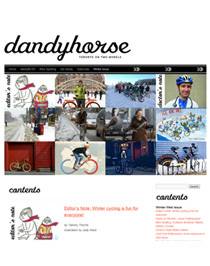 Subscribe to dandyhorse magazine now to get dandy delivered to your door! Bike advocacy organization members: Enter your discount code below before clicking on "Check out with PayPal." Find out more about our advocacy discount program by contacting subscribe @ dandyhorsemagazine.com today! 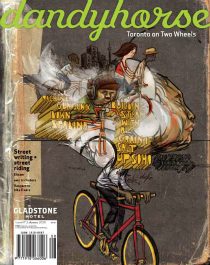 dandyhorse magazine needs your support to keep rolling. Any profits from dandyhorse magazine sales go back into the production of the magazine. dandyhorse would not be possible without the kind donations of our contributors. We are volunteer run. 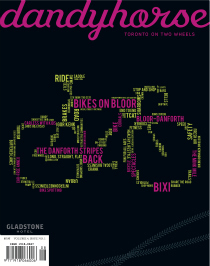 Consider giving the gift of bike love and buy a subscription for a friend. Email accounting @ dandyhorsemagazine.com with any questions or special requests. We need your support to stay dandy! LIMITED QUANTITIES OF BACK ISSUES AVAILABLE! To order a back issues in any quantity please email subscribe @ dandyhorsemagazine.com. All back issues are $5.95 + HST and shipping each. What does it take to create a bike lane?